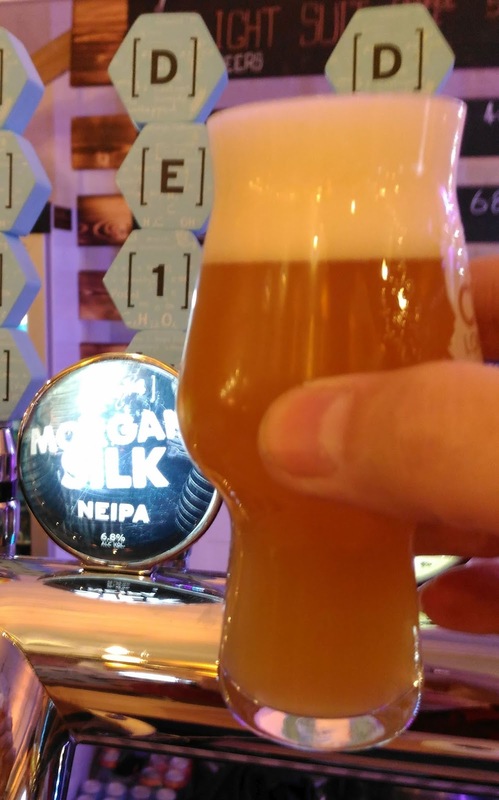 At last year’s Craft Beer Rising, and in the run up to this year’s edition of the show, most of the conversations I had with brewers and others in the trade centred around how it had become largely a trade and show-off event. No one expected to sell anywhere near enough beer to recoup the costs of being there – a serious four-figure sum for most of them – so they were there to promote their brands, network with others in the business, discuss work opportunities, and so on. Or in several cases, they were not going to be there, because they didn't feel the need for those things. As Pete Hughes, head brewer for the Brewhouse & Kitchen group, told me last year, “We’re here to build awareness and to participate, we don’t think of this as a money-making event. If you’re already at maximum [production] capacity you’re here for fun or to make contacts.” Sure enough, when I met Pete this year he was enjoying the event, but just as a trade visitor, leaving the awareness-generation to those in more of it. 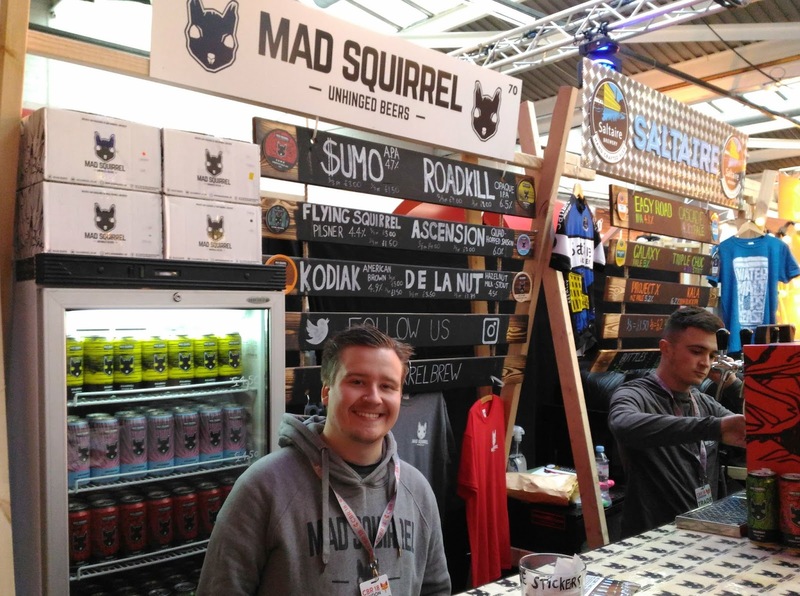 And what a lot of them there were – from small first-time exhibitors, through local brewers trying to break into Craft or out of their local region, to well-known brands ensuring that they stay that way. Which makes it a little surprising that the organisers had apparently reined back the availability of tickets for the trade session – or they had done in the run-up, anyhow. When I turned up with all my paperwork ready as instructed*, no one actually looked at it and there were no queues or checks beyond a spoken “Got an invitation, yeah? Alright.” Upstairs, the halls were surprisingly quiet, so perhaps they overdid the restrictions! My initial aim was to work out where the talks were being held later that afternoon, as I wanted to attend Goose Island’s class on beer & cheese pairing. This gave me a destination for a leisurely meander route through the halls, spotting sights of interest along the way. On the other hand, Tim also highlighted a welcome result of all this, which is the return to vertical integration, where the brewer is also the retailer. Mad Squirrel now has five outlets around the Chilterns (including the brewery tap), which Tim characterises as half bottleshop, half bar. Indeed, where five years ago Red Squirrel employed seven staff, the company now has around 50, two thirds of them on the retail side. 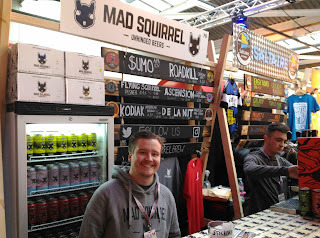 I tasted two of the Mad Squirrel beers on tap. Kodiak was very pleasant, but odd – described as a American Brown but more of a dark amber, and hoppy like an American Pale, with little of the malty toastiness one tends to expect in a brown ale. The other, Ascension, was a gorgeous Farmhouse Ale, strong in the Belgian Saison vein at 6%, and richly hoppy thanks to an unusual extra dose of hops in the mash, alongside the usual boil hops and dry-hopping. Sort of a Saison/New England IPA hybrid. Further along, I spotted Edinburgh’s Bellfield Brewery, which is one of several gluten-free brewers that have emerged lately. 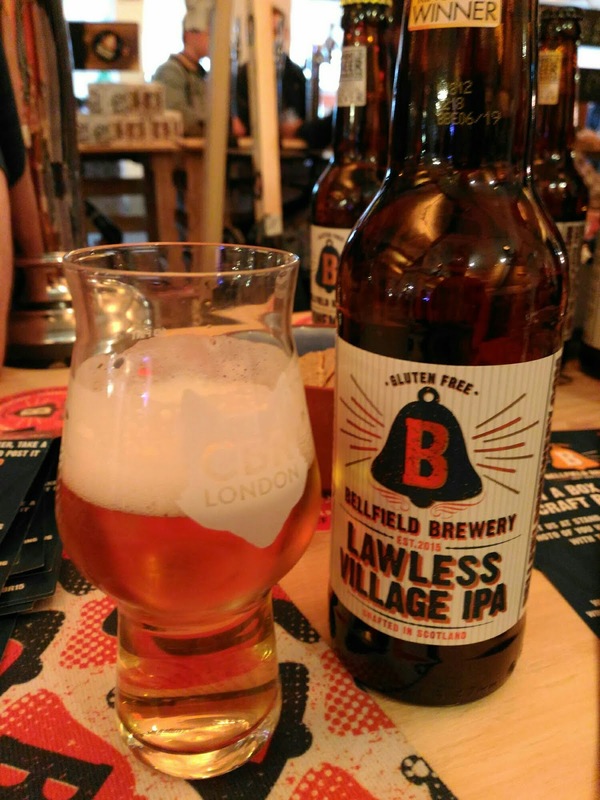 Having spoken to a number of others in this area recently, including Autumn Brewing Co who I met at PubShow18, I will write more about gluten-free beer soon. Next to catch my eye was the Marston’s nano-brewery DE14, which is where the brewers from the big Burton brewery get to experiment and try out new ideas – and also where they host local homebrew clubs and the like. The latter is where Morgan Silk, their lovely New England IPA, came from – it is named after its creator and was originally his response to a challenge set to the homebrewers to create a beer using breakfast cereal – I’m told his prototype had Special K in it! That had to be swapped for equivalent base ingredients for rebrewing on DE14’s two-barrel brewkit, but the result remains juicy, creamy and spicy-fruity. Most DE14 brews aren’t widely sold – they might go into the brewery taproom, a few local bars, and local beer festivals, say. But at CBR I also got to see cans of the first two DE14 brews to graduate to full commercial production: End Point, described as ‘a modern take on the historic Burton IPA’, and Flight Suit, which is a pale ale with both Mandarina Bavaria hops and orange peel for added citrusness. Needless to say, these are brewed on the main brewery, which can brew up to 500 barrels at a time with a minimum run of 60 barrels (hence the desire for a smaller experimental brewkit). This was about when I spotted the talks room – more on that later! *With no press registration offered for the trade session, I had originally decided I wouldn’t be going this year. However, I was chatting with Hannah, one of Goose Island’s UK PR team, about their plans for the event. She knew of a writer who had a ticket via Goose Island but couldn’t now attend, so at the last minute I was able to substitute for him – thanks Hannah, and thanks Goose Island! Sad to say though, the restrictions on trade ticketing were such that even Hannah and her colleagues couldn’t attend, despite their work on promoting the event. Most strange.